For full terms and conditions visit houseoffraser.co.uk/giftcard or call 0845 602 1073. This eGift Card will expire 24 months from date of last use. No change will be given, the remaining balance stays on the eGift card. eGift Cards cannot be returned or refunded, except in accordance with your legal rights. At expiry, any remaining balance will be cancelled. Protect this eGift Card and treat it as cash; it cannot be replaced if lost or stolen. eGift Cards are only redeemable for merchandise in House of Fraser stores in the United Kingdom, Ireland and online at houseoffraser.co.uk (exclusions apply). This eGift Card cannot be exchanged for cash, used as payment on Recognition MasterCard accounts or to purchase financial services. House of Fraser reserves the right to amend these terms and conditions from time to time where it reasonably considers it necessary to do so. The balance of this eGift Card may be checked in store, online at houseoffraser.co.uk/giftcard or by calling 0845 602 1073. House of Fraser eGift Cards offer the best in brands. They can be spent in any one of our 61 stores nationwide, or online at houseoffraser.co.uk. 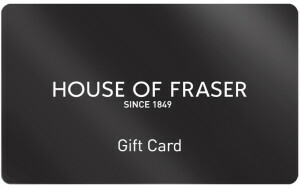 Print off a copy of your eGift Card, or present the eGift Card on your mobile device’s screen, at the till for payment in House of Fraser Stores. The amount of your purchase will be deducted from the balance on the eGift Card. This eGift Card can be spent online at houseoffraser.co.uk by following the Gift Card instructions at the online checkout.